AloeHa Smoothie was posted on May 14th, 2011 and is filed under Breakfast, Dairy Free, Drinks & Smoothies, Recipes, Vegan. This entry has 9 comments. You can follow any responses through the RSS 2.0 Comment Feed. I have heard of the benefits of aloe vera for a long time, but I never was inspired to use it. It seemed since we had a small plant the effort to extract the gel wasn’t worth the time…perhaps if I had one of those giant aloe plants all the health nut gurus seem to have, it might be. But after ages of not using it internally (I use it externally for burns, a moisturizer, or a bad sunburn) I decided to give it another go. …After all, the virtues of aloe seemed quite astounding. It is said to contain all the vitamins, except vitamin D, that we need on a daily basis. It also contains minerals, enzymes, anti-microbial, amino acids and sugars that are crazy good for our bodies. Aloe vera is good for aiding digestion, reducing inflammation, helping to detoxify, and easing muscular conditions and allergies. So I scraped away at some of the aloe leaves and put the gel into the fridge for when the mood for an aloe smoothie came upon me, which it did. 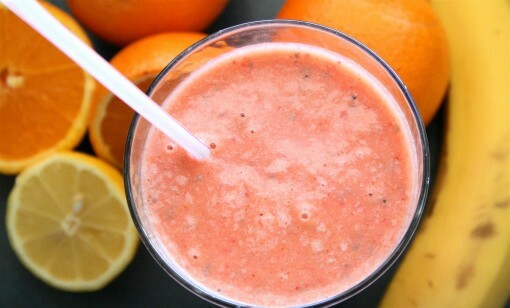 I made this into a tropical smoothie just loaded with all the sunshine fruits, oranges, strawberries, lemons which have over %200 of vitamin C (of your daily need for the C-vitamin) making this a great recovery beverage for colds or flus. It is also high in calcium and fiber. The chia seeds and coconut oil give the drink the healthy fats, the lemon and aloe vera help detoxify the body, all in all…making this a very rounded, healthy breakfast. This beverage serves 2-3. Blend everything together. Add ice if it’s not cold enough. Drop in some fun, bright coloured straws and you’re ready to guzzle. Don’t you feel better now? Have you ever tried aloe vera in a recipe? How do you use it? Sounds like a really good smoothie! Makes me want a aloe vera plant my self! Nature is sooo cool! I had no idea you could eat aloe vera! Or all those benefits from it! 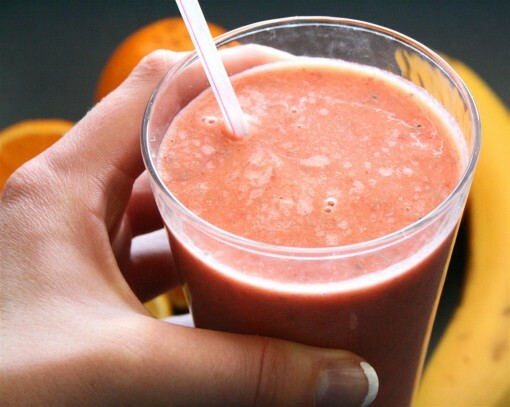 This smoothie looks like a delicious way to try it out. I love the name. It’s so creative of you to add aloe vera into your smoothie. If you like aloe vera in your drink, you should also try the korean aloe vera and honey drink – look out for it when you are doing your Asian grocery shopping. :) It’ll save you the hassle of scraping the gel off the leaves, lol. I’ve seen bottles of aloe vera drinks in the health shop but never thought of using the plant in smoothies – might have to get a new plant, I managed to kill mine! Emily~ Interesting! That would be neat to try. I’d love to use aloe vera more! Suzie~ Haha, yes…I think killing houseplants is one of my secret skills as well. I have had an aloe vera plant for years but also only recently heard about the benefits of eating it too. I tried eating it a couple of times but thought if I eat the gel from a leaf every day soon I’ll have no plant left, so I decided to take cuttings from my plant so I could grow some more and I now have them all over the house. I haven’t got very green fingers though and I’m not sure if they’re going to survive or how often to water them etc. This looks like a great smoothie, I’m going to give this a try. MMM the smoothy looks yummy. I use the whole leaf from the plant, not just the gel. They sell “whole leaf aloe juice” so I figured why not. They multiply quickly. Put them in a sunny window & water ocassionally and they will multiply.